Chemical Mixing Machine AVS-150 - GlobeCore. Oil Purification Systems. The Chemical Mixing Machine operates on the principle of transforming the energy of electromagnetic field into other forms of energy. The unit is a chamber (pipeline) of 90-136 mm diameter, located inside rotating electromagnetic field inductor. There are ferromagnetic cylindrical elements of 0.5 – 5 mm diameter and 5 – 60 mm length in the operating area, from several dozen to several hundred (0.05 – 5 kg), depending on the volume of the work zone. The chamber can be designed in several ways depending on the requirements of the processes in the chamber. For liquid phase processes, strainers are installed on the sides of the bush, or at outlet end only. If fibrous materials are processed, labyrinth type strailers are installed. These devices hold the ferromagnetic particles in the work zone. Consumption of energy in the chamber is defined only by its design, material and the thickness of the walls and does not depend on magnetic field strength. To reduce energy consumption, we manufacture the chamber from a non-magnetic material (stainless steel). The main components of electromagnetic units with vortex layer are: the inductor of rotating electromagnetic field with cooling system, connected to three phase 380/220V, 50Hz power supply, and operating chamber with ferromagnetic elements. 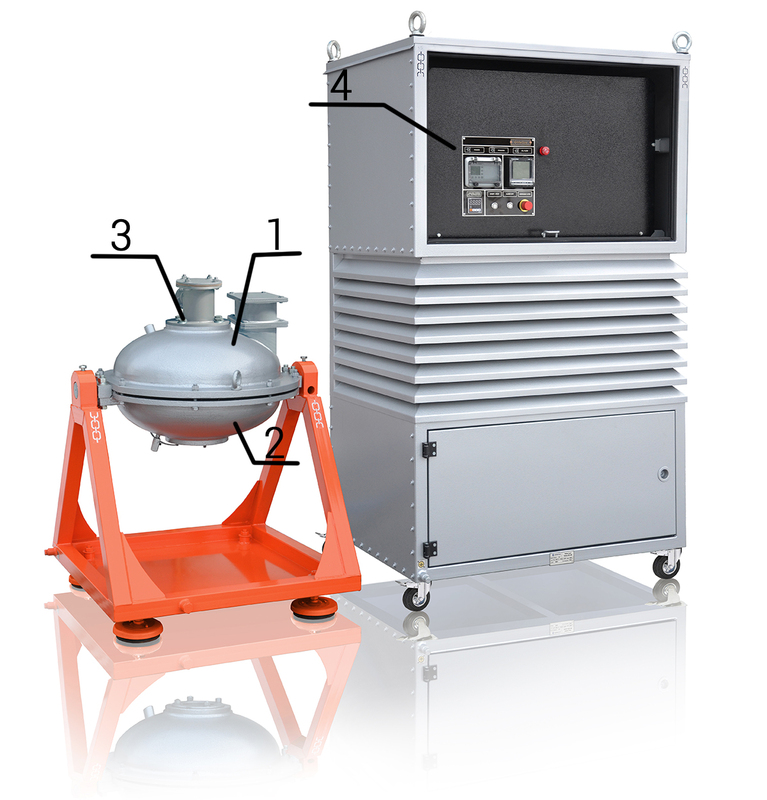 Chemical Mixing Machine AVS-150 with ferromagnetic elements are designed to intensify various physical and chemical processes. production of suspensions and emulsion of increased microbiological safety in food production without the used of staibilizers and increase of product output. simple to retrofit into existing processing lines.